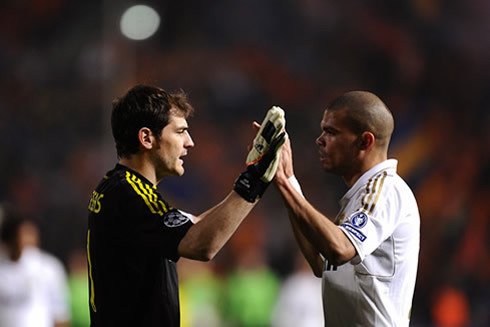 APOEL fought bravely but couldn't avoid to concede three goals from Real Madrid and ended defeated by 0-3. José Mourinho brought in Kaká and Marcelo during the 2nd half and that decision proved to be crucial in unblocking the game further on. Benzema with two goals and Kaká with one, scored the goals for the Merengues. 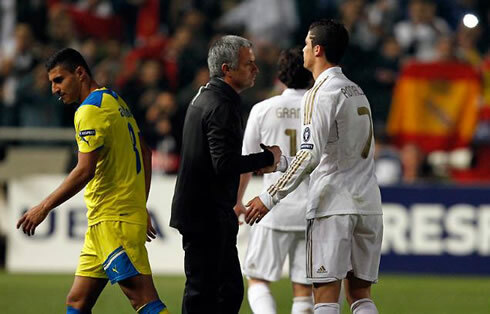 Semi-finals are already at sight, as Real Madrid travelled to Cyprus and defeated APOEL by 0-3. The Merengues controlled the game from the beginning to the end and brought home an important victory that left no margin for doubts. After several good chances on the 1st half wasted by Benzema and Cristiano Ronaldo, Real Madrid found an effective way to beat APOEL, essentially due to the contribution of two players that came from the bench, Marcelo and Kaká. The Brazilian duo vitalized the team and besides Kaká hitting the back of the net, they would also help creating enough spaces for Benzema to score a brace. This allows the French striker to become the Merengues top goalscorer in the UEFA Champions League, with 7 goals out of 9 matches, surpassing Ronaldo who has netted 6 goals so far. José Mourinho certainly realized before anyone else that his team was going to have a patience game ahead of them. In a UEFA Champions League quarter-finals stage and having in mind the kind of pressure inherent to anyone coaching Real Madrid, very few would have the courage to sit Kaká and Marcelo on the bench and start with Nuri Sahin and Fábio Coentrão in their places. The most glaring and surprising decision has probably been starting with Nuri Sahin, since the Turkish player has barely played this season and there isn't much room for mistakes in any European nights 1st legs. It's true that Mourinho was forced to make changes on the midfield, since Xabi Alonso got suspended for 1 game, but there were surely alternatives that seemed more logical and less risky to ordinary men, as it would be the case of opting for Esteban Granero, or playing with Kaká more upfront and Khedira ahead of the defense backline, in Xabi Alonso's role. Once again, Mourinho proved he's not called the "Special One" by chance and forced newspapers and TV critics to review their antecipated disaster that they probably started preparing when they looked at the line-up, just before the game. The 1st half story didn't provide many incidents to talk about, as Real Madrid easily controlled APOEL, but struggled to breach into their defense. However, one of the best chances took place close to the 33th minute, in a play where Karim Benzema was responsible for one of the misses of the season. It all started with Cristiano Ronaldo, who dribbled three defenders when cutting inside from the left and passed the ball to Nuri Sahin. The Turkish midfielder spotted Benzema appearing on the area and made a low first-touch cross that only required an easy tap-in. Benzema probably got surprised with how easy that goal would be and shockingly failed to hit the target. Half-time was around the corner and even though a 0-0 wouldn't be such a bad result at the end, Mourinho knew Real Madrid could do better on the 2nd half. But surprisingly, José Mourinho didn't make any change right after the break and the game kept being played with the same tone, as Real Madrid controlled everything but recurrently bumped into someone from APOEL's defensive wall. However, near the 63th minute, the fate of the game changed when Kaká and Marcelo came in, replacing Higuaín and Fábio Coentrão. The game pace increased and Real Madrid became more incisive in their attacks. Just 10 minutes after the substitutions, Benzema scored the opener after a great play from Marcelo and Kaká, with the last one making a guided cross to the Benzema's head. Once again, Mourinho seems to have the Midas touch, as everything he touches from the bench, turns to gold. As it usually happens in games where we have upon us a typical "David vs Goliath" clash, when the smaller team concedes the first goal, the competitive aggressiveness levels drop like flies, as well as their belief in pulling off a surprise at the end. This being said, it wasn't that surprising that Real Madrid reached their second goal of the night, less than 10 minutes later, around the 82th minute. Cristiano Ronaldo backheel pass to Marcelo allowed him to explore a dangerous space inside APOEL's penalty area and in a great effort, the Brazilian slided to avoid the ball crossing the end line, assisting Kaká for an easy finish and making it 0-2. The final blow took place already in the 90th minute, with Cristiano Ronaldo once again starting the play and setting up a good pass to Mesut Ozil on the right side. The German playmaker then had a brilliant assist to Karim Benzema, as he crossed the ball with the outside part of his foot (some call it a "Quaresma" tradermark pass), which Benzema only had to tap-in. Unlike what happened in the 1st half, this time the Frenchman didn't miss and Real Madrid closed the game, setting the final score in 0-3. On a final note and particularly targeted for the most skeptic fans who may still think Real Madrid didn't perform that well, you can simply look at the stats table below and see how dominating the Merengues actually were. Numbers speak for themselves as APOEL didn't collect a single shot during the full 90 minutes of the game and Real Madrid ended the match with stats indicating 77% of ball possession. Nonetheless, we can probably still expect a big wave of critics beind made to Real Madrid and José Mourinho in tomorrow's newspapers. 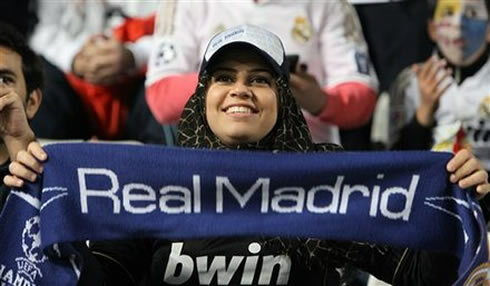 The second leg will be played next week, in the Santiago Bernabéu, on the 4th of April (Wednesday). If Real Madrid confirm their passage to the semi-finals, they will face either Bayern Munich or Marseille. Real Madrid next game is for La Liga, against Osasuna, this next Saturday (31-03-2012). You can watch Juventus live stream, Osasuna vs Real Madrid, AC Milan vs Barcelona, Marseille vs Bayern Munich and QPR vs Arsenal, all from our football live streams section. Cristiano Ronaldo is expected to be a starter when Real Madrid visits Osasuna, this next Saturday.